December (pronounced duh-SING-ga) is a slang term for the month of Dismember. It is a magical time when snow covers the land and Santa Claus rides around on his sleigh pulled by flying reindeer. Unless, of course, you live in the Southern Hemisphere, in which case El Santo Jesús will ride into your town on a burro and give you a taco. 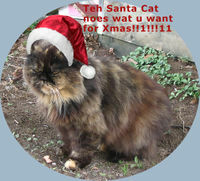 Teh Santa Cat noes what joo want 4 xmas!!!1! December was discovered inJ 1952 by an intrepid team of explorers inhabiting Czechoslovakia. The natives prayed to December as their God, offering up a human sacrifice, but that was all ruined when the explorers captured December and brought it back to civilization. It was put on display and paraded around the nation. This is also the month the world discovered that behind the scenes of the Simpsons, Lisa was a prostitute. Tragedy struck on May 8, 1955 when December escaped from its cage and disappeared into the wild of Nevada. No trace has ever been found of it since. Its very existence is doubted by many foremost scientists of the day, including Albert Einstein, who was said to say "December? I'll show you a December, just like I showed your mom my December last night!" Strangely, only one clue to the location of December has turned up since the disappearance, occurring in the Marilyn Monroe movie Some Like it Hot. In the scene on the beach, if you look towards the upper right-hand corner, you can just make out a blurry object that vaguely resembles the description of a December. No explanation has ever been offered by the producers or the government. Mix, stir to taste. You've just made yourself a tasty December! December is also the month in which Shatmas falls. One of the cardinal holidays of the Shatifferous faith, Shatmas is only second to the Ides of Smarch in religious importance. This page was last edited on 10 September 2012, at 05:37.